Leighton's Jewelers in Madera, CA: jewelry store, bridal jewelry, engagement rings, wedding bands, diamond jewelry, loose diamonds, rings, custom jewelry, retail jewelry, certified loose diamonds, jewelry repairs. Currently we do not have any Offers. Please check back soon for updates. Copyright 2017 © Leighton's Jewelers. All rights reserved. 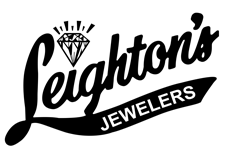 Visit Leighton's Jewelers for great prices on loose diamonds, bridal jewelry, engagement rings, wedding bands, custom design jewelry, diamond and gold jewelry. We also do quick, expert jewelry repairs, watch battery replacements and watch link removal. We carry a variety of brands such as, Allison Kauffman, Victor Corporation, Seiko and Pulsar.